Q. When will the milk in the new glass bottles be available? Milk will be available for purchase in retail outlets in Victoria from Friday April 12th, 2019. Q. Where will the milk be available to buy? The full list of Founding Retailers is on our website - www.schulzorganicdairy.com.au. We will add to this frequently. Q. How much milk is in each glass bottle? Each glass bottle holds 1-litre of milk. Q. Will you be releasing reduced fat milk in glass bottles? No, at this stage only full fat milk in 1-litre bottles will be available. Q. What is the cost of the milk in glass bottles? Retailers will set their own price per 1 litre bottle. The additional element will be a $2 refundable deposit per glass container unit. Q. Why is there a refundable deposit charge for the glass bottle? Creating a circular economy is the only way to truly minimise waste. We want to get many many uses out of these glass bottles and we believe that putting a price on the vessel is the best way to do this. In fact, evidence we gathered from overseas showed that a container deposit scheme ensured a bottle was more frequently returned if a deposit was requested. We hope that a returnable deposit helps incentivise consumers and retailers to return the bottles. Q. How do we return the glass bottles? Return the glass bottle(s) to any of the Retailers (schulzorganicdairy.com.au/glass-bottle-retailers) or to the Schulz stand at Farmers’ Markets. Q. What condition does the bottle need to be in, in order for the retailer to accept the returns? Glass bottle: is the Schulz bottle (not an alternative brand or type) - our bottle has a distinct moulding with the Schulz logo. The bottle must be completely cleaned of milk residue, and have no chips, scratches or cracks. Lid: IS CLEANED AND IS RETURNED WITH THE BOTTLE - the lid must be completely cleaned of milk residue. Label: the new label is a cardboard sleeve that can be recycled after a single use. This does NOT need to be with the bottle unit when it is returned. Q. The lids are plastic - why use plastic lids when you are trying to close-the-loop? Tamper-proof - a critical food safety safeguard, especially for retail. Peel-back light aluminum lids: We considered these however because our milk is unhomogenised and requires a fair amount of shaking to disperse the cream these we deemed not ideal. Also they don't have the ability to be resealed, and therefore it would be impossible to reshake the bottle when the cream rises overnight. These lids are also too easy to tamper with. Steel lids: these lids also have a plastic insert to prevent leaking and during our trials rusted through the washing cycle (and didn’t have tamper evidence rings). This lid type would require an additional plastic label to provide the tamper evidence that regulation requires. Despite our exhaustive research, plastic lids remain the best option - for the moment. We continue to talk with manufacturers to seek new solutions - it is not just us that are pushing for this industry change. The lids we are using are made from plastic and are fully recyclable. Unfortunately the lids cannot be reused because the plastic is subtly porous and therefore cannot be safely cleaned and reused. We have managed to reduce our plastic per bottle from approximately 42g to 4g. Q. What do you do with the plastic lids if they are not reusable? Plastic lids remain the best option for sealing our milk-in-glass bottles - for the moment anyway. In order to minimise our lid waste, we are working with various social initiatives to put our plastic lids to good use. Our first project partner is ENVISION. Envision works with a number of organisations transforming plastic bottle caps into prosthetic hands. About 500 of our Schulz milk-in-glass bottle caps are used to create one prosthetic hand for someone in need. www.envision.org.au. If you know a great organisation upcycling plastic that we can support, let us know. Q. What is the lifecycle of each glass bottle (how many times is one bottle likely to be reused)? We estimate that each bottle will have a reuse lifespan of at least 8 refills, but we hope for much more than that. 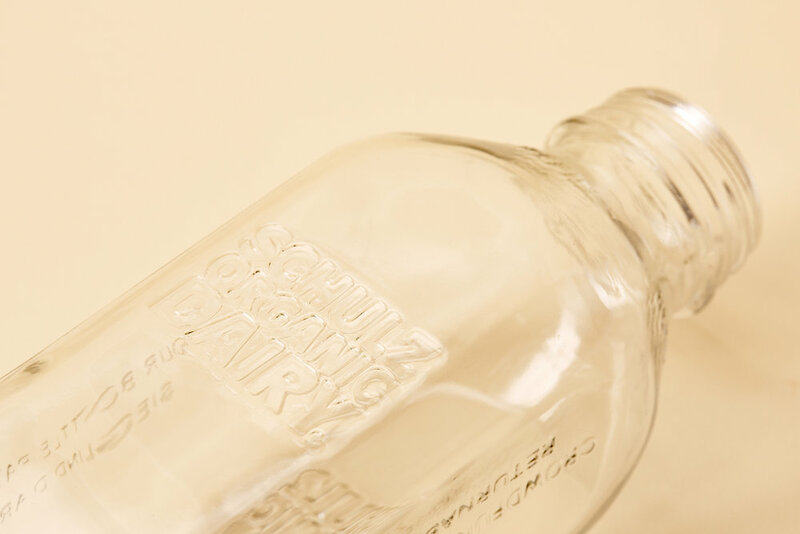 Our moulded bottles have the year of manufacture embossed into the glass - this is a key way for us to establish the longevity of their use. Q. How much plastic is saved by using one reusable glass bottle? Each glass bottle sold will save approximately 40g of plastic, or 120 kg per week across 3,000 bottles. Q. how can i support you guys to make change? Tell your friends and share share share on social media.